Around 8 years ago, the Karnataka government’s scheme to provide free pads to schoolgirls had come as a great opportunity for 30 women in Dharwad. They were employed at three units in Shivalli, Bellur and Morab villages to make these napkins. But this happiness didn’t last long. Few years later, the state stopped funding these units as they received pads at a cheaper cost from a marketing organisation in Karnataka. “They suddenly started buying pads from the marketing organisation for they gave Shuchi pads at much lesser cost than these village setups,” said Girija Meti, a dentist and a campaigner for sustainable menstruation in Dharwad. These women were left without jobs and their products unattended since they entirely depended on the government to provide them a market and the government expected them to create for themselves. They went to do odd jobs and find a living. “Since these three setups didn’t generate a market of their own and were completely dependent on these school supplies, when the Health and Family Welfare department started funding the project to supply pads to even aanganwadis and other institutions, there was no need to locally hire people to make pads from 2013-14,” said Snehal R, CEO, zilla panchayat, Dharwad. The zilla panchayat then decided to make a switch to sustainable living, which included sustainable menstruation. “The zilla panchayat and we are planning to find a solution to the problems of these women working in those units that were left in the lurch by the state government. They were made to invest their time and then left unattended. Their stock was even not picked up,” added Meti. Finally, Stonesoup, an organisation that sells menstrual cups and cloth pads while campaigning for sustainable menstruation, offered to hire these women. The zilla panchayat played the role of a catalyst in making this happen as it even gave out cloth pads as awards to winners of competitions held in the district on Women’s Day. 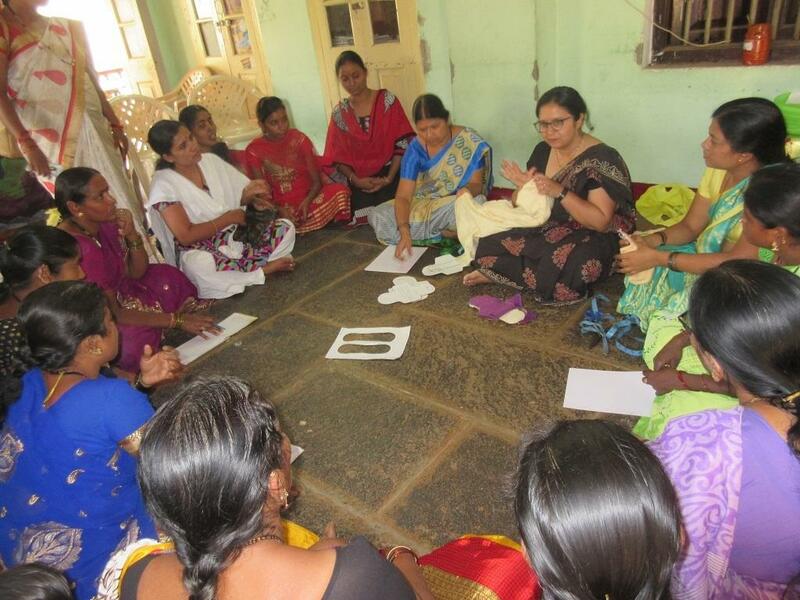 “We are now tying up with Stonesoup to see if these women can make cloth sanitary pads. We have so far been able to find 12-13 women of the 30 women and are helping them,” said. Currently, they are receiving training from the organisation and are preparing samples and since most women in villages use cloth during their periods, the knowledge of ‘how to use’ cloth could help them personally. “We found out that 80 per cent of women in villages still used cloth. They just needed to be told how to use them the right way. It should be dried in the sun and washed with cold water. Since unlearning is a difficult thing, it’s a challenge to convince women,” said Meti, who is also a farming enthusiast.